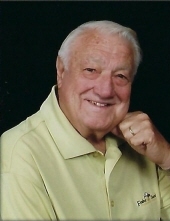 James Edward "Jim" Bernardo, 85, of DuBois, passed away on Thursday, March 14, 2019 at his home. He was born November 20,1933, to the late Anthony and Ellen (Harris) Bernardo in DuBois. He married Claire Lois "Perk" Bernardo on January 3, 1953, in DuBois. She preceded him in death on January 26, 2016. He graduated from DuBois High School in 1951 and retired from Bell Telephone after 40 years of service. Jim was inducted into the Clearfield County Regional Chapter Sports Hall of Fame in May of 2003. He was an extraordinary athlete at DAHS in sports. He played on the team's first Western Football Conference Championship team in 1949, as well as being an outstanding player on the District 9 Southern Division Champion Basketball team, but it was his exceptional playing on the school's baseball team that resulted in a minor league contract with the St. Louis Cardinals. His professional career was cut short as the result of a leg and ankle injury. Jim was also on a Championship Bowling team with his father, Tony, and his uncles, Jim, Fury, and Ed. He was among the top sluggers for fast-pitch and slow-pitch softball teams for more than 20 years, having played with some of his best buddies in the game he loved. He also enjoyed many years of golf in his retirement with his sons, grandchildren, relatives, and friends. Jim was a member of the Mount Zion United Methodist Church, Methodist Men, Bell Telephone Pioneers, Olympic Club, where he served as past-president, Falls Creek Eagles, Pulaski Club, and the Sandy Club. Jim is survived by his four children, Lois (Edward) Richards of Curwensville, Lori Swope, Richard (Patricia) Bernardo, and Robert Bernardo, all of DuBois; a brother, Russ (Joan) Bernardo and a sister, Diane Bernardo of DuBois; his grandchildren, Michael, Carrie, Matthew, Robert, Rhonda, Amy, Stephanie, Nathan, Larissa, Kaylee and Beau; his great-grandchildren, Owen, Parker, Isabella, Claireese, Maya, Lakelyn, Aiden, Kaleb, Noah, Owen, Bentley and Lincoln; and two nieces, Sherry (Don) Bernardo and Lisa (Rick) Owen. He was preceded in death by his parents, wife, and several uncles and aunts. Per Mr. Bernardo’s wishes, there will be no public viewing. A memorial service and celebration of Jim Bernardo's life will be held at 3:00 p.m., Tuesday, March 19, 2019, at Mount Zion United Methodist Church, DuBois with the Rev. Corben Russell officiating. Interment will be in Morningside Cemetery. The family requests memorial donations be made to Mount Zion United Methodist Church, 16 Denton Ave., DuBois, PA 15801 or to the charity of the donor's choice. To send flowers or a remembrance gift to the family of James Edward "Jim" Bernardo, please visit our Tribute Store. "Email Address" would like to share the life celebration of James Edward "Jim" Bernardo. Click on the "link" to go to share a favorite memory or leave a condolence message for the family.